Designed by Studio Marconato & Zappa, the Alumina kitchen for Comprex Cucine features finish-brushed aluminum honeycomb panels, available in a luscious palette of nickel, bronze, copper, and iron sand. 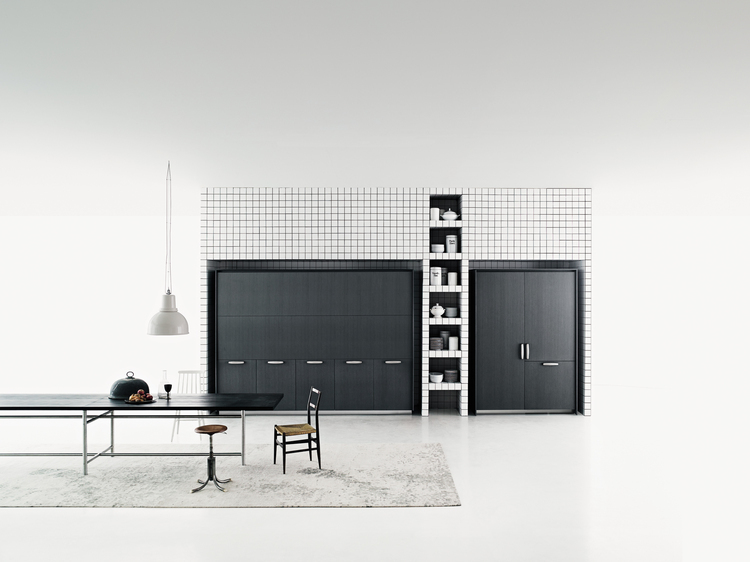 Thick melamine-coated panels and upward folding doors make up Boffi's On/Off ST suite, designed by Alberto Colonello. Powered by electronic controls, the discreet units open up to reveal worktop stations. Premiering this year, Snaidero's Code Evolution, designed by Michele Marcon, combines Oak Beton and Oslo Oak melamine to create an effect of cement and reclaimed wood that feels both industrial and rustic. Dada's classic Vela Kitchen, newly updated with improved handles and mechanisms by Dante Bonuccelli, implements continuos white panels and slim doors measuring just 13 mm thick. Heat-treated oak veneer cabinets, a stately table counter, and a white matte-lacquered island compromise GD Cucine's Elite kitchen. Large-capacity base cabinets make for ideal storage. Porcelanosa's Emotions kitchen collection pairs natural wood and lacquered, fingerprint-resistant laminates in 64 available finishes. Its doors are also cut with laser technology for seamless edges. Danish designer Mette Schelde deconstructs the kitchen into three components - cutting station, stove, and sink - with her prototype Et Køkken. Inspired by communal firepits, it's made of oak, steel, and terrazzo. Material surfaces of the Filolain kitchen by Euromobil are made with eco-friendly, non-toxic, water-based coatings. Side-partition shelving with yellow color accents give it a sleek and subtle punch. Resembling plow lines on a farm, the ridge's of Kohler's Whitehaven Hayridge apron-front sink give texture to an otherwise simple, rounded-corner form. The enameled cast-iron basin, crafted mostly from recycled materials, is available in 17 colors. Pedini adapts to spaces of all sizes with its customizable System collection. Folding cabinet doors reveal a stainless-steel and dark-elm work space. Surrounding it are plenty of lacquered white shelves for cookbooks and dishware. The floating countertop of Poggenpohl's Segmento unit leaves just enough space above the cabinets for users' hands, allowing for its characteristic handleless fronts. New editions in stone grey (shown here) and polar white are now available. Those for whom the division between pantry and living room is amorphous or nonexistent can rejoice: Open by Scavolini allows for a fully functional kitchen without boundaries. It boasts bookshelves and a coat closet, along with base units for cooking supplies. The attention-grabbing Board - designed by Pietro Arosio for Snaidero - makes the kitchen the centerpiece of the home. Its cantilevering sink and food-prep unit, made of lightweight Corian acrylic, can be overlaid with side-in chopping blocks. Press a button and part of the rust-finished wall of Warendorf's Hidden Kitchen folds open to reveal cooking and storage areas. Camouflaged pull-outs and cupboards surround the 16-foot-long nook, which boasts integrated lighting and electrical appliances. Thick-cut white oak takes the spotlight in GD Cucine's rustic Legno Vivo kitchen, designed by Roberto Pezzetta. The island features drawers on one side and open-face shelves on the other, as well as an extendable breakfast-table attachment. With Dada's recently updated Tivalì unit, designed by Dante Bonuccelli, users can slide out its doors to cover up the wall unit and storage space inside a single, unembellished volume. Hidden LEDs illuminate the entire back panel. Boffi's K20 updates the design of the brand's K14 modular units with new materials and finishes. Range burners are directly integrated into the countertop (which is available in stainless steel or Corian acrylic), making for a smooth, uninterrupted work surface. Scavolini's Motus wall system can be customized with varying configurations. A free-standing island doubles as a table and features a solid-oak top alongside cabinet drawers and pull-out baskets. Poggenpohl's P7350 kitchen by Porsche Design Studio is marked with high-precision manufacturing techniques, including vertical brushed-aluminum trims that emphasize its elongated proportions. Stainless steel, Corian, and lacquered doors make up Poliform's modular Phoenix kitchen. A wood countertop and interior shelving accents bring warmth to its streamlined, monochrome appearance.